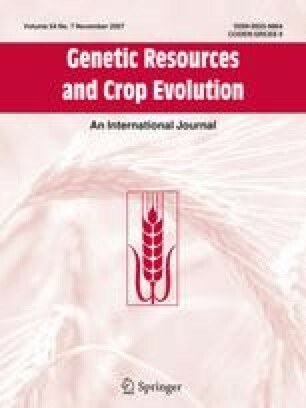 Fifty-three wheat cultivars have been genotyped using 24 SSR (simple sequence repeat) markers in order to evaluate genetic similarities among Polish wheats, i.e. 53 spring and winter cultivars; ‘Chinese Spring’ was taken as reference. ll but one SSR marker allowed to identify DNA polymorphisms, giving in total 166 alleles (including nulls), from 3 to 13 alleles per marker with mean of 7.22. Based on marker data, genetic similarities were calculated and a dendrogram was created. ‘Spring’ cultivars were less diverse than winter ones, showing the biggest similarity to ‘Chinese Spring’. Four sister cultivars (Nutka, Tonacja, Zyta and Sukces), formed a cluster of very similar materials, of which Zyta and Sukces had the highest similarity indices. Parental lines Jubilatka and SMH 2182 were more distant from each other (genetic similarity of 0.227). It was possible to differentiate all the wheats using only four SSR markers: Xgwm186, Xgwm389, Xgwm459 and Xgwm577. Authors would like to thank Dr. Marion Röder for the sequences of unpublished microsatellites. This research was supported by PBZ KBN 029/P06/2000/09 grant. Łukasz Stępień received a Foundation for Polish Science scholarship for the year 2005.